This is quite rightly a UNESCO World Heritage Site. There is much to see here, since there are no fewer than seven temples in various states of preservation. These include the Temple of Concordia (in fairly good condition) and the Temple of Heracles, which only has a few columns left from the original building. 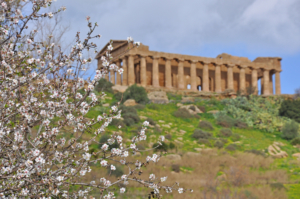 One of the main things to be aware of when visiting Agrigento in search of ancient sights to see is that the Olympeion field is not far from the Valle dei Templi mentioned above. You can see some excellent examples of telamons here too. These are large figures designed from rock, some of which are in better condition than others. One in particular is lying on the ground with his hands behind his shoulders. The ruins you will find in Syracuse are at odds with their surroundings, often consisting of lush greenery. However they are as much a part of Syracuse as any modern tourist attractions could be. Protected by UNESCO, the ruins at Syracuse include the Necropolis of Pantalica. This is an area famous for its small tombs cut into the rocks on the hillside. There are thousands of them in all, laid out in several distinct areas. Personally I love the Greek theatre here, since the scale of it is still very easy to appreciate today. Indeed if you are fortunate you may be able to book tickets to see a performance here, since the theatre is still used in the modern day. Nearby you can also see the remains of the Temple of Apollo. The garden here is lovely and provides you with an opportunity to see the temple as it exists today while enjoying the surroundings too. A visit to the Greek temple is one of the highlights anyone can add to their itinerary while in or near Segesta. Most of us can conjure up an image of what a traditional ancient Greek temple should look like. The temple at Segesta will faithfully reproduce those images for you in reality. The temple here no longer has a roof, but every single one of its pillars remains. The ends of the temple on its narrower sides are six pillars wide, while the sides are fourteen pillars in length. The Doric temple, believed to have been built around the 5th century BC, sits in the middle of the countryside. Lush green trees punctuate the more barren surroundings around the temple, and once you are there you could easily forget which century you are in.